In Houston, on Monday, 28 January, a no-knock search warrant resulted in the wounding of four police officers and the death of middle aged couple who had owned their home for 20 years. The Tactical Enforcement Unit arrived to search a home in the 2900 block of South 12th Street at 9:17 a.m., and three minutes later officers made contact with two people and "shots were fired," Assistant Chief Michael Brunson Sr. told reporters earlier Wednesday. A neighbor said he heard a loudspeaker calling out an address about 9:20 a.m. Wednesday and walked to his window. He then saw a black armored vehicle and police officers swarming the house and heard about five seconds of gunfire followed by someone yelling, "Shots fired!" 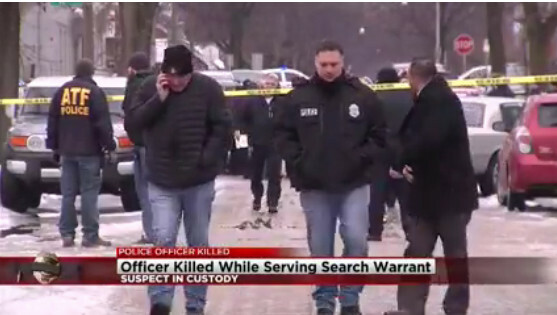 On Wednesday, February 6th, 2019, at about 9:17 a.m., the Milwaukee Police Department's Tactical Enforcement Unit responded to the 2900 block of South 12th Street to conduct a search warrant. The target of the search warrant was wanted for the illegal sale of firearms and drugs. While conducting the search warrant, officers announced themselves as police at which time the suspect fired several rounds. Officer Matthew Rittner was struck by gunfire and transported to Froedert Hospital, where he unfortunately succumbed to his injuries. Fricke did not have any misdemeanor or felony arrests prior to the raid. The search warrant has not been published as of this writing. I have not found any reports of charges being filed against Fricke or the other person in the house when the raid was conducted. It is unknown if recordings of the raid and gunfire are available, or if body cameras were worn. The Wisconsin Department of Criminal Investigation is investigating the incident. Wisconsin requires an outside agency to investigate police shootings. I have doubts that a person inside a house would "reasonably have known" that the people breaking in were public safety workers, simply from a loudspeaker on the street. There are many details about the raid that are not known at this time. They include the number of shots fired, what caliber(s) were used, whether officers returned fire, the particulars of the warrant, and whether any contraband was found at the house. It could be days or weeks or even months before we determine if this is another tragedy caused by the overuse of no-knock raids. The older I get, the less impressed I am by The War On Drugs. Do illegal drugs damage society? Arguably. Do they damage society as much as the measure taken to eradicate the trade in them? I am increasingly inclined to doubt it. Moreover way the War on Drugs interferes with the treatment of chronic pain is in no way justified by any believable number of self-destructive idiots kept from abusing painkillers. I am increasingly in favor of making the Big Three (Marijuana, Cocaine, and Heroin) legal. After all, if it turns out to be a mistake, we can change things back again. There would be too many of the law makers to go back to illegal they would have to stop inhaling. Marijuana is very dangerous because it is a step up drug it can be laced with anything and get people hooked on much stronger drugs. Don'[t expect the people weak enough to use illegal drugs to act responsibly, expect many more drug related car crashes. Those irresponsible people will be driving in an altered state running down the road away from the tyrannosaurus Rex chasing them down the highway. I worked in a drug rehab unit. surprising how many re admits or corporate CEO'd.